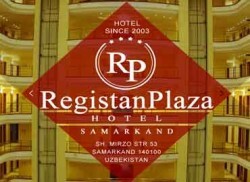 We have honour to introduce you Registan Plaza in Samarkand. Conveniently located in the city centre, the Hotel is in immediate proximity to both business part of the city and historical sights of the Old Town. Design and structure of the Hotel as well as its interior meet the up-to-date standards of the hotel industry. You and your guests are offered high-quality european services with underlying Oriental hospitality. Street: 53 Shohruh Mirzo str.